The 2019 scholars for A Better Chance of Westport. It’s difficult, requires long-term commitment and it’s not something everyone in his situation could do. But it’s worth it, if you do manage to make it to the top. “I know that reaching the summit of Everest will be my greatest accomplishment so far,” he wrote. By all rights, Ferguson should not have graduated from Staples. In 8th grade he attended school in his native Philadelphia. It was only through a grant from A Better Chance of Westport that gave Ferguson the opportunity. The organization will hold its signature event on March 30, at Rolling Hills Country Club. Called the “Dream Event,” it’s the primary fundraising vehicle through which inner-city students like Ferguson are able to get a Westport education. Every year, the event features speeches from former students and performances from Westport student musical groups. They’ve been doing it since 2002. 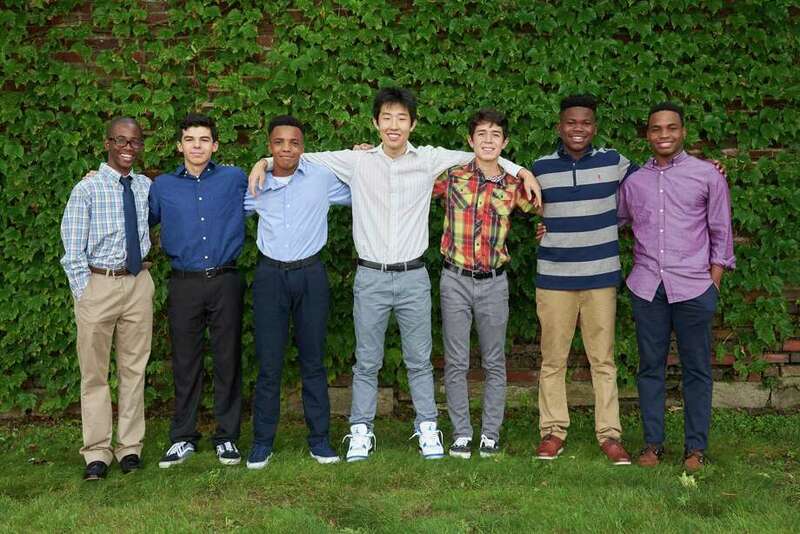 “Each year, we continue to be moved by the words and accomplishments of our scholars, and this year’s Dream Event should be another night of inspiration and celebration,” A Better Chance Westport Co-President Michele Mitnick said in a release. This year’s Dream Event will feature a performance by the Staples High School Orphenians, speeches by two graduating seniors, a cocktail party, dinner, and silent and live auctions.